Since the February blackouts in South Australia, the Australian government has increased its interest in carbon dioxide capture and storage (CCS). However, in Australia and elsewhere, CCS is closely associated to so-called “clean coal” technologies. The media sometimes treats them as one and the same thing. Given the negativity with which the general public, and expert commentators view “clean coal”, this confusion is distracting attention from other sectors where CCS can make a unique and substantial contribution. CCS is vital for “clean coal”. Even the most efficient coal-fired power plants emit huge amounts of carbon dioxide. Unless these emissions are captured and stored in rock formations thanks to CCS, meeting climate targets with coal power is impossible. But here’s the thing: carbon dioxide can be captured from any large-scale source. This means that CCS has a valuable role to play in other industrial sectors – as long as clean coal’s bad reputation doesn’t drag CCS down with it. 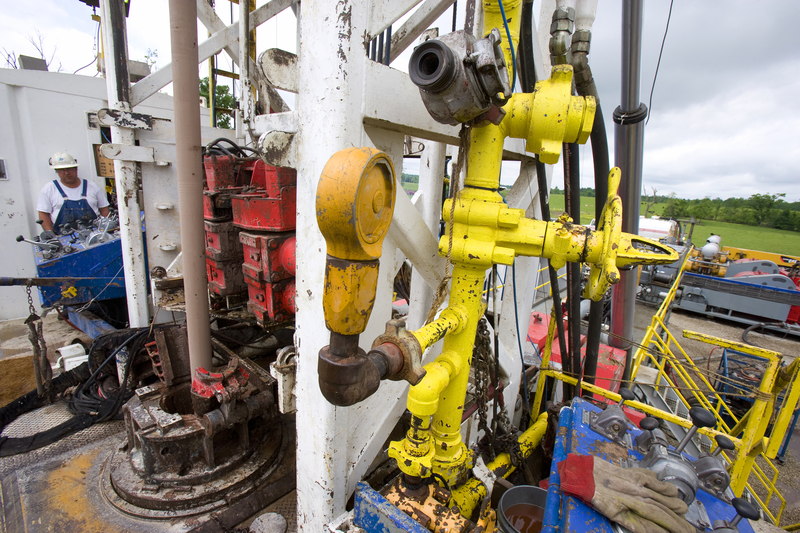 About half of the global potential for CCS by 2050 has been estimated to lie in industry. Some sectors like synthetic fuels and hydrogen production may not grow as predicted. But others such as cement, steel and ammonia, are here to stay. Several recent UK reports on industrial decarbonisation argue that CCS brings emissions reductions beyond the 50% needed by 2050 required in most sectors and countries. For cement in the UK, the report argues, efficiency and other measures could deliver a roughly 20% emissions reduction by 2050. But adding CCS could bring this figure to 54%. Meanwhile, the British steel industry could cut emission reductions by 60% compared to 34% without CCS. For UK chemical manufacturers, these figures are 78.8% versus 34%. These processes often produce a high-purity stream of carbon dioxide that avoids the costly capture methods used for power applications. So why aren’t industries like these the stars of carbon capture and storage right now? Unlike the power sector, which is under pressure to reduce emissions, other high-carbon industries currently have little incentive to pay the estimated cost of US$50-150 per tonne of carbon dioxide captured. Carbon pricing has been hard to introduce even far below such levels. However, if CCS is to be deployed by mid-century, concept demonstration and confirmation of suitable storage sites needs to start now, and on a wide enough scale to deliver useful emissions cuts. Other strategies may be needed to incentivise it. CCS was first mooted in 1976, but it only caught world leaders’ attention in the mid-2000s. However, over the past decade its popularity seems to have waned, perhaps because of the “clean coal” issue. In 2005, WWF joined Europe’s CCS platform, and the following year the environmentalist George Monbiot described the technology as crucial. But over the ensuing ten years, as a “hype process” around CCS for clean coal developed, industrial CCS was largely ignored. At its peak in 2007, proponents announced some 39 CCS power projects, most of them coal-fired, aiming to capture an average per project of 2.2 million tonnes (Mt) of carbon dioxide per year. Yet by early 2017, only two large-scale power projects have been completed around the world: Boundary Dam, capturing 1Mt per year, and Petra Nova, capturing 1.4Mt per year. Number of carbon capture and storage projects by type since first concept. Mature refers to projects in sectors in which capture is routinely commercial, such as in natural gas processing. Immature refers to projects in sectors where capture is not the norm, including power generation, steelmaking, and certain chemicals. 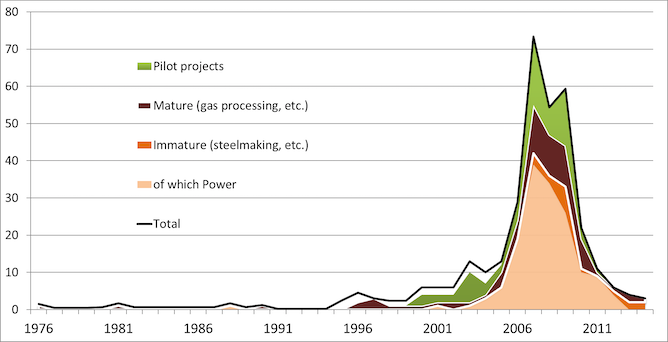 The share of power generation projects among immature is highlighted. Cynicism around the technology has grown, with the Australia-founded Global CCS Institute recently being described as a “coal lobby group”. Unfortunately for CCS, the focus has been mostly on the gap between announced and successful “clean coal” projects, rather than on its contribution to industrial emissions reduction. Last year, Emirates Steel Industries completed its steelmaking CCS project, which now captures 0.8Mt of CO₂ per year. Australia will soon be host to the world’s largest CCS development, at the Gorgon LNG Project, which will store 4Mt a year from 2018. Steel, gas-produced ammonia and other industrial products will be fixtures of the 21st century, whereas coal-fired electricity has no such certainty. Economies that aspire to 100% renewable energy will have no room at all for coal, “clean” or otherwise. Even if our electricity and transport were to become 100% renewables-based, there will be parts of the economy where greenhouse emissions are hard to eliminate. It is important that the unpopularity of “clean coal” does not distract from the importance of CCS in decarbonising other industries.